A tribute to the revolver that made Samuel Colt legendary. Designed in collaboration with Capt. Samuel Walker of the Texas Rangers, Samuel Colt's 1847 Walker Revolver became one of the most feared weapons of the West. Its 60 grain charge was more than double that of any other revolver, granting the 1847 Walker enough stopping power to bring down a horse. At 4.5 lbs., it remained the world's biggest and most powerful revolver right up until the introduction of the .357 magnum. The legend lives on with this faithful, real-shooting, premium-quality Reproduction from Uberti, the premier name in historical recreations. It's faithful down to the last detail, with 9" barrel, gorgeous 1-pc. walnut grip, steel backstrap... even the original 4.5-lb. weight! It's a hoot to shoot, and an absolute looker all the way. If you're looking to scratch your classic shooting itch, you will not be disappointed. 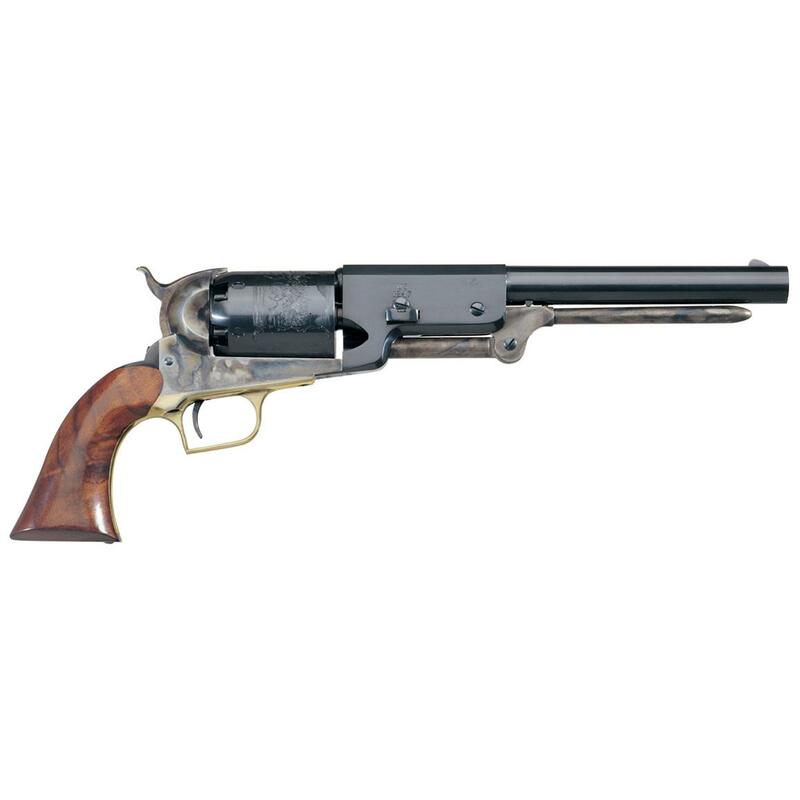 Uberti Reproduction 1847 Colt Walker, .44 cal., 9 Barrel, Black Powder Revolver, 6 Rounds is rated 4.8 out of 5 by 42. Rated 5 out of 5 by Dano from Love it I'll start off but saying I haven't shot black power in a long time. It's kind of messy. I hunted with it in the past but got away from it. I've wanted a Walker for a long time but since I didn't hunt with black power i put a Walker on hold. Now that I have this one in hand i feel like I missed out on a beautiful handgun for many years. Yes it's beautiful. This feel awesome in my hand. I don't think I'll be shooting this anytime soon. This is only because it's so pretty. It is for together very well. I'll be looking for a holster for her. You never know when I'll be e they urge to shoot this beast of a gun. For now I'll be content to just holding her. The case Harding is wonderfully done. Cylinder is huge. Yes I know of the Walkers shortcomings but that's ok. I'm a 44 mag follower and this Walker will, and is a great addition to my big magnums. Rated 5 out of 5 by Tommy from been watching the price got one I receive my walker in 3 day's after ordering.after cleaning I loaded it with 45gr. 3f .451 round balls didn't shoot well,I now have .454 round balls will try again. Rated 5 out of 5 by Alan from Great Quality at a Good Price This Uberti replica of the classic Walker Colt is very faithful to the original. Very fun to have on the range and always a conversation subject. Rated 5 out of 5 by Zorburg from Beautiful gun I bought this about a month ago. Very nice workmanship. I have only put 12 rounds thru it. It worked flawlessly. Rated 5 out of 5 by Junglebiker from Shock and Awe In a word: Awesome. I've read the reviews, I've watched the videos, but those are nothing compared to actually owning an Uberti Walker. "Monster", "Behemoth", "Giant", "Beast"; you cannot handle a Walker without these words coming to mind. If it's an Uberti Walker, then you will also be thinking "Nice", "Quality", "Slick", "Crisp", mine has a fabulous trigger. Ordinarily I can't justify the cost of an Uberti, but I got this one on sale, and it has opened my eyes to the difference between Uberti and other Italian replicas. Uberti may just represent the best deal after all. Rated 5 out of 5 by Phil from Better than expected This thing is a beast at 8-1/2 pounds, I can get rid of my barbells now. Seriously, the workmanship on this is excellent, and the fit and finish is as good as anything that comes out of Hartford. The first disassembly was a little unyielding, but once the preservative oil is cleaned out it’s slicker than snot. I just wish Uberti would include a decent box. Rated 5 out of 5 by Heplar from Holy Mother Six Shooter!!!! 16 inches long and weighing in at 5 pounds and yes, I'm talking about this revolver and not what a guy wishes! I live here in Eastern Idaho and I received this a couple of weeks ago (winter). It's been very cold and finally I could wait no more. I wanted to chronograph this thing as well as I couldn't find any info on this revolver and it's velocities. I'm glad to report that at 25 yards, it was nice and tight. The grouping was about 6 inches high and the 45 grain charge of fffg Shockey Gold behind a wonder wad and a .451 Hornady round ball chronographed at about an average of 880 fps, temperature was 13 degrees , This is a joy to shoot and comfortable to handle.